The BK-117 medium-weight multipurpose helicopter programme was given the go-ahead on 25 February 1977 with the signing of an agreement between the German consortium Messerschmitt-Bolkow-Blohm and the Japanese company Kawasaki Heavy Industries, following more than two years' negotiation. Both partners could boast considerable experience in the rotary wing sector and the new aircraft, which was an eight-ten-seater, was intended to replace two projects studied independently by the two companies: the German Bo.107 and the Japanese KH-7. Joint development costs were to be divided equally, the financing being guaranteed by the respective governments. MBB was to be responsible for the main rotor and tail rotor, tail boom, empennage, hydraulic system and controls, while Kawasaki was to develop the landing gear, fuselage, transmission and other minor components. The relationship of the BK-117 to the Bo.105 is evident in many respects. Firstly, a fair percentage of parts and systems are identical to those of the German helicopter. The hydraulic system is based on the original Bo.105 version and even the rotor is taken from the Bo.105, suitably enlarged to match the demands of the bigger and heavier BK-117. The four-blade rotor is of the rigid type with a titanium hub and reinforced fiberglass blades. The transmission is, of course, derived from the Japanese KH-7 project: a seven-ten-seat helicopter which was to have been fitted with two 590shp Lycoming turbine engines. The BK-117 in fact also has a pair of Avco-Lycoming LTS-101-650B-1 engines, delivering 600shp on take-off and 550shp maximum continuous power. The fuel tanks, with a total capacity of 605 liters, are housed in the lower part of the fuselage. The executive version of the BK-117 carries a pilot and five passengers, but given the volume of 3.22m3 there is ample room for nine passengers in the high density version or in those used for commuter and offshore services to oil platforms. In the latter roles, it can carry a substantial payload, and even bulky goods can be easily loaded through two large sliding doors, one on either side of the fuselage. Behind the passenger cabin is a large baggage hold with a capacity of 1.34m3, which is reached through two hinged doors at the rear of the fuselage. Alternatively, the helicopter can be equipped to carry four stretchers plus two medical attendants; other roles include fire-fighting, search and rescue operations, or a cargo hook can be fitted to the cabin floor for external lift work. The first German prototype flew on 13 June 1979 and the third (Japanese) aircraft on 10 August of that year. Production was initiated almost immediately and a year later, more than 100 BK-117s had been ordered. By the beginning of 1982, the BK-117 prototypes had logged more than 750 flying hours and type approval by the German Federal Authorities followed shortly afterwards. Half of the 130 aircraft ordered by February 1982 were for customers in the United States, where deliveries began in early 1983. Following the signature of an agreement in February 1977, MBB and Kawasaki in Japan initiated the joint development of a new twin-turbine utility helicopter, suitable for both civil and military use, designated MBB/Kawasaki BK 117 With an airframe structure very similar to that of the MBB 105, the BK 117 combines the MBB BO 105's rigid rotor with a transmission developed by Kawasaki and introduces as powerplant two Avco Lycoming LTS 101-650B-1 turboshaft engines. It provides accommodation for a pilot and seven passengers as standard, or a pilot and up to six passengers in an executive layout. The BK 117 can be equipped for use in roles such as cargo transport, firefighting, law enforcement, medical evacuation (with pilot, one or two stretchers and two medical attendants/sitting casualties), offshore support, and SAR. German and Japanese prototypes flew for the first time on 13 June 1979 (D-HBKA) and 10 August 1979 (JQ0003) respectively. Kawasaki was first to fly a production aircraft (JQ1001) on 24 December 1981; MBB followed with D-HBKC on 23 April 1982, this machine being the first production aircraft to be delivered to a customer, in early 1983. In addition to being built in Germany (at Donauworth) and Japan (Gifu), an agreement was concluded in 1982 for the type to be built in Indonesia under licence by IPT Nurtanio as the NBK-117. By January 1990 more than 250 BK 117s had been delivered worldwide, including 36 by Kawasaki, the standard aircraft now being the BK 117B-1. Since April 1990 a BK 117 engine testbed has been flying equipped with Turbomeca Arriel turboshafts in an effort to offer customers an alternative engine, and certification was scheduled for 1992. On 1 September 1991, MBB transferred its Helicopter Division to Eurocopter Hubschrauber GmbH. This was later integrated with Aerospatiale's helicopter interests into the Paris-based Franco-German Eurocopter Holdings, placing the NH-90, BO 105, BO 108 and BK 117 into a world class helicopter grouping. I want to buy Kawasaki BK-117. If you nave BK for sale in good condition, let me know, please. I'm a BK117 maintenance engineer with 17years experience up to and including A9 servicing's. I hold a SACAA licence for BK117 and B412. I'm looking for work anywhere. Do you know who the company use BK117 Heli in INDONESIA? The alternate part numbers are 2549102-1 and 2549102-2. I am looking for any condition even good repairable units. Your launch into the helicopter world. We are Best Bridge & Trust Agency. We represent government body in Democratic Republic of Congo that wants to purchase military equipments, so we are looking for contact for supply of used military equipments. We want to purchase 10 units of military choppers,UAV, armored land rovers, military trucks, military boats,telecommunication equipments,marine equipments, corporate jets and commercial Aircraft. If you can assist, please kindly provide me with your price and specification. We are looking forward for your respond. can u give me z price and full information. We have BK 117 in good condition, immediately available for sale. Is there anybody out there (Engineers?) that can help me with information on the BK117B1 fitted with Lycoming LTS 101-750B-1 engines? I am in particular interested in the ETM (Engine Trend Monitor) system fitted to these engines. Can any company or government organisation help or advise on this proposal? Hi,i have 450hrs on BK117 and its certainly the most reliable,cost effective machine around.I'm looking to purchase one with 750 motors,can u advize me as to whom to contact regarding this. i am in need of 10 unites of bk117 used on but in very good condaition weher i can get that.? I Really Appreciate It's Top Most Selling Helicopter On 1979 or 1980 But Now In Current Year There Are So Many Ultralight And Good Looking Well Designed Helicopter Available. hi there, i'm a military helicopter pilot and i've got 500hrs on the BK117. its a very reliable a/c with low maintenance needs. i'm interested in purchasing one. a certain seller said i should make an offer, his BK117C has 1100 airframe hrs,IFR rated with VIP configuration. can u pls tell me what it should sell for? its a BK117C-1, 2002 model. thanks. � MBB abandoned its armed military BK 117A-3M, but 'civilian' machines have been sold to military customers. � Kawasaki flew the first production BK 117 on 24 December 1981. 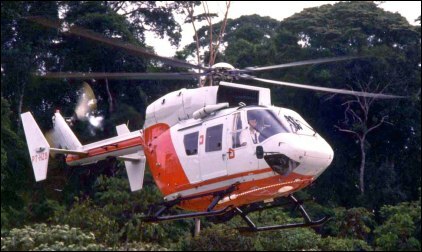 � Several features of the BO 105 were retained or modified in the BK 117. � MBB abandoned its BO 107 design and Kawasaki its KH-7 project in favour of joint BK 117 production. � The first aircraft from the MBB production line flew on 23 April 1982. � Germany's ministry of defence used one BK 117 as a composites testing aircraft.